The term green coffee bean is used for a coffee bean that is not roasted. It will still have an intact was layer on the outer surface. Both mature and immature beans can be green beans (= not roasted beans), although mature green beans tend to shift colour from green to yellowish, brownish or reddish. Green coffee beans have been processed to separate the pulp and mucilage of the coffee berry from the bean inside. For more information about this process, see below. Many pest animals and insects shy away from green coffee beans since these beans contain certain volatile and non-volatile compounds that deter the animals. One such compound is the famous caffeine. Since the early 21st century, green bean coffee extract has been available in the trade as a nutritional supplement. The coffee bean is the seed of the coffee plant. Coffee plants are found in the genus Coffea, which contains over 120 different species. The two most commonly cultivated ones are Coffea arabica and Coffea canephora. 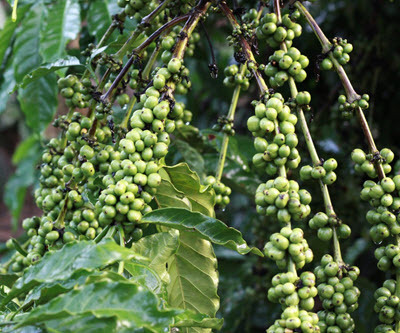 The coffee tree produces red or purple fruits (epigynous berries) known as coffee cherries. Coffee cherries contain one or two seeds – the coffee beans. Coffee beans aren’t true beans; they are just called beans since they look like beans. When the coffee cherry is ripe, it is picked from the tree. The pulp and mucilage is then separated from the beans using either the wet method or the dry method. Wet method: The pulp is removed from the beans, but the mucilage remains. The mucilage covered beans are soaked in water for roughly two days. During this time, fermentation takes place. The fermentation process softens the mucilage and makes it possible to easily wash it off using water. The wet method is common in Central America and certain parts of Africa. Dry method: The coffee cherries are spread out in the sun and left there for two to three weeks. They need to be turned regularly to ensure even drying. The underlying surface is usually concrete, bricks or raise beds. This method is cheaper and easier than the wet method. Historical, the method has been common in Brazil and most of Africa. Today, a more elaborate version of it, that yields a better result, has begun to spread outside these areas. Green coffee bean extract is a popular dietary supplement, often promoted as a weight loss aid. Some products contain only coffee extract while others are a mixture of various compounds with alleged weigh-loss promoting properties. In 2017, a review assessed effects of chlorogenic acids, which are the main phenolic compounds in green coffee extract. This review looked at chlorogenic acids consumed via ordinary coffee and in the form of a purified extract. The results suggest several beneficial effects, especially when it comes to improved glucose and lipid metabolism. There was also notable anti-oxidant and anti-inflammatory activity. For more information, see: Tajik, N; Tajik, M; Mack, I; Enck, P (8 April 2017). “The potential effects of chlorogenic acid, the main phenolic components in coffee, on health: a comprehensive review of the literature”. European journal of nutrition. 56: 2215–2244. doi:10.1007/s00394-017-1379-1. PMID 28391515.